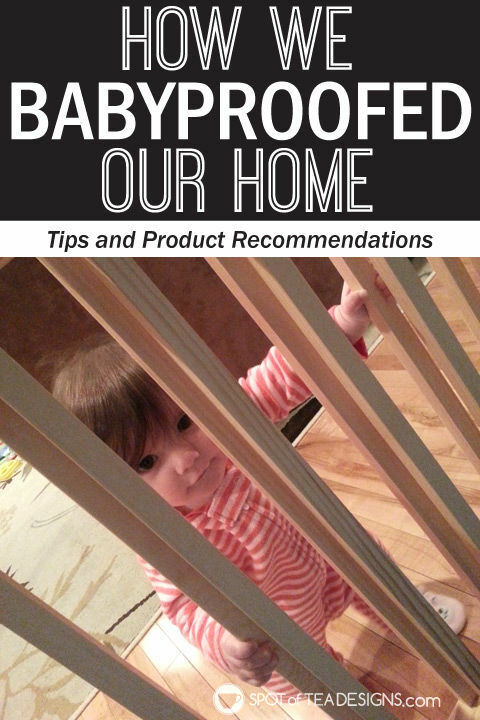 You can never baby proof your home too early when it comes to keeping your kids safe! Continue reading to discover the products we used in our split level home on the stairs, the kitchen, and all the spaces in between. Add some of these baby proofing items to your register and get used to all the magnetic locks you’ll be living with once baby is on the move! With a split level home we have lots of sets of stairs, lots of little rooms and lots of spots to baby proof! Below are the key places we made sure to secure starting at four months, which luckily was needed with a 6.5 month crawler and 9 month early walker! We have lots of railings on our living room/kitchen level that overlooks our front entrance level. We chose to use the zip tie method to secure a Summer Infant Dual Banister Gate at the top of the main level in which we live. You can find the full tutorial on how we secured that item here. For the side that goes up the stairs, we were able to then use a pressure gate, using the white wood post that was secured to the railing as one side and the trim on the wall as the other. Note that over time there has been a little wearing to the paint along that trim but I don’t think that’s avoidable and a fault of the gate. We fully expect to need to do some cosmetic updates to our home once the kids are bit older. At the top of the stairs, we had to use yet another type of swing gate and we had no choice but to secure it to one side of the wall with holes. Luckily our good old zip tie method worked up here to save us from drilling into a wood banister. Tip: For top for the stair gates, make sure to look for ones that do NOT have any sort of wood structure that lays across the bottom of the gate when opened. It is another tripping hazard and therefore totally dangerous at the top of a set of stairs! over all four of our covers. and at first only secured it on the bottom drawer of the oven. She learned to open the bottom drawer first since it was more in reach but once standing and pulling on things, there was a need to secure the oven door also. At 18 months she was very funny, telling us “ought oh!” every time we opened the oven to grab something out just to check it, but didn’t relock this lock. She didn’t understand the concept of checking on the food and was the best safety police to make sure we secured the lock again. for ones we access more often. We have the magnetic lock also in our living room so we actually have two of the locks in case we misplace one. Tip: keep it in a standard spot (ours is by the sink) and practice putting it back there after every use!
. For more tips on getting up your nursery, make sure you read this and learn from my mistakes! Oh and the crib has been moved over since taking this photo as she was too close to reach the light switch and turned it on once or twice! Secured Bookshelf to Wall – Our Ikea bookshelf came with a kit to secure the bookshelf to the wall so sorry, but no product recommendations here. But a much needed reminder for safety! Pool Noodle Door Stoppers – Brielle loves to open and close the doors upstairs and with a fear of her locking herself in, we added these not so beautiful but cheap and useful pool noodle door stoppers on top to prevent that from happening. lock. Note that this lock isn’t meant to be used on doors which you need to or can open from either side. in both our bathrooms. Yes they can be inconvenient at times but are simple to use so it hasn’t really been a big deal. TIP: Since we have it on both the bathroom near our bedrooms and the guest one downstairs, I made sure to craft up a little directional sign for guests so I didn’t have to give a live tutorial every time someone needed to use the facilities.